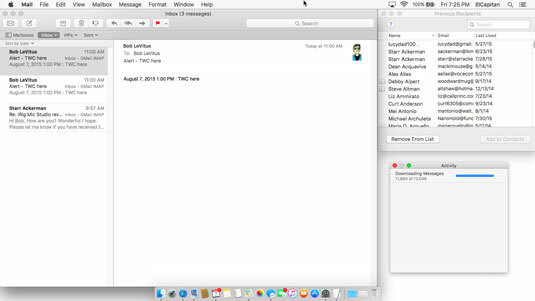 If Mission Control in OS X El Capitan lets you manage your windows in real time, its spaces let you manage windows by organizing them in groups called spaces and switch from space to space with a keystroke or gesture. When you use spaces, only two kinds of windows are shown: windows from applications associated with the active space and windows from applications launched while that space is active. If you find yourself spending too much time moving and resizing windows onscreen, consider setting up spaces for specific tasks. You might have one space dedicated to a specific project, another for web surfing, and a third for email, each with all its windows arranged just the way you like them. Think of a space as being a single screen, set up just the way you like it, with its windows arranged just the way you like them. Take, for example, the three spaces shown here. This web-surfing space has three Safari windows all arranged the way the user likes ’em. My Mail space, with three Mail windows arranged just so. 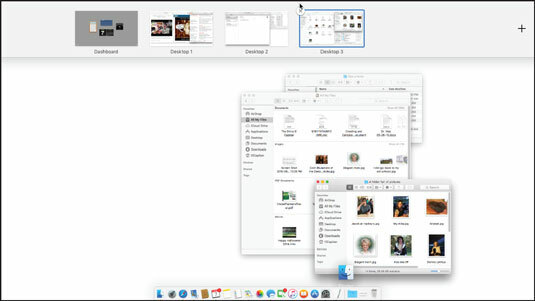 A Finder space, with two windows in list view plus a third window in Icon view. Moving right along, you manage your spaces with Mission Control, which provides an overview of what’s running on your Mac, including all your spaces, the Dashboard, and all open windows. 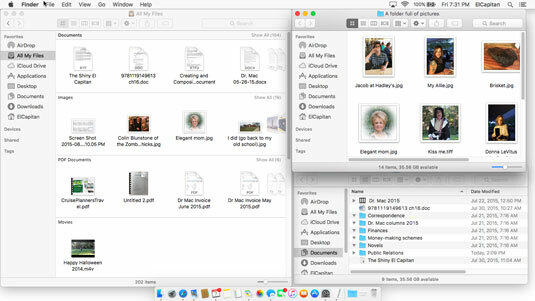 In a nutshell, this dynamic duo makes it easier than ever to manage and maintain the mélange of Finder and application windows that conspire to clutter and eventually consume your screen. To see it in action, press the Mission Control key (Control+up arrow by default). If you have a trackpad, you can also swipe upward using three fingers to see Mission Control, which will look something like the following figure based on the three spaces shown earlier. Mission Control showing off Dashboard and three spaces (Desktops 1, 2, and 3). Note that you won’t see a Dashboard Space in Mission Control unless you’ve selected As Space from the Dashboard pop-up menu in the Mission Control System Preferences pane. And if you don’t see the thumbnail pictures above the names Dashboard and Desktop, hover your cursor over them and the thumbnails will appear like magic. In earlier versions of OS X, these desktops were called spaces. Mission Control, improbably, uses the words spaces and desktop interchangeably, so as you see the three spaces are named Desktop 1, Desktop 2, and Desktop 3. By the way, apps running in full-screen mode are automatically considered a space, which bears the name of the app rather than Desktop X. To add a new space, first enter Mission Control; then move the pointer to the top-right corner of the screen and click the Add (+) button. Note that if you have your Dock on the right side of the screen, you have to move your pointer to the top-left corner for the + to appear. Click a space at the top of the screen to switch to it. Press the Mission Control key, press the Esc key, or swipe upward with three or four fingers to return to the space you were using when you entered Mission Control. The three-finger gesture requires a Magic Mouse, Magic Trackpad, or laptop with a new style (buttonless) trackpad. If you’re using a notebook Mac, learn to use gestures with Mission Control. Visit the Trackpad System Preferences pane’s More Gestures tab and make sure you’ve enabled three- or four-finger swipes so that you can swipe between Mission Control spaces. One last thing: OS X El Capitan takes full advantage of multiple displays no matter how many displays are connected to your Mac. 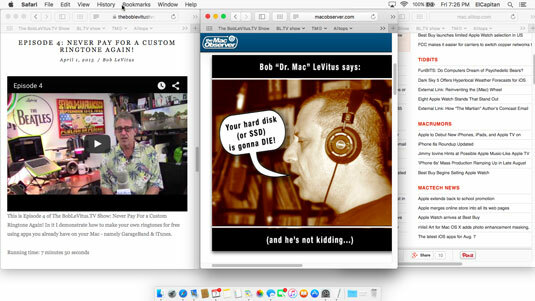 So, for example, you can work in the Finder’s Desktop on one display and use a full screen app on another. And finally, each display has its own exclusive set of Mission Control spaces associated with it. You can drag and drop spaces from one display to another. Try it — it’s way cool!